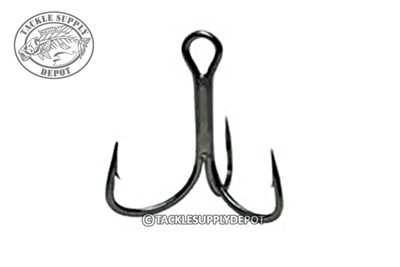 Mustad TG100NP-BN Pete Maina 2X Strong / Long Treble hooks are extremely wide gaped treble hooks for big lures and big mouths. Featuring Mustad's 4.3 Ultra Point technology. Absolutely ideal for targeting big freshwater species like pike and musky. Outstanding hooking and holding capacity. Coated with Mustad all new Black Nickel that are 4 times as rust resistant as traditional Black Nickel. Chemically sharpened high carbon steel.